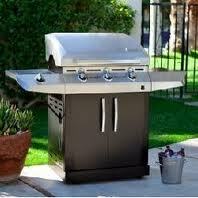 Use my outdoor barbecue grill comparisons guide to make the right choice when buying your next bbq grill. Below you'll find lots of information about fuel choice and many objective grill reviews (in the column on the right). Size In particular the size of the cooking surface. Consider how you are going to use your grill, if it’s for a small family then 300 - 500 sq inches will probably be sufficient but if you have a large family or are into big party cookouts then look for a larger cooking area, say 700 sq inches. Construction Materials Many grills also come in rust and weather resistant finishes so if your grill is going to stay out all year round then this should be an important consideration for you. Stainless steel is best. Note that you don’t have to pay the earth for a weather resistant finish however you may have to compromise on some other features. The other way to guard against the elements is to buy a grill cover. Grates In my experience the easiest to clean are porcelain enameled grates. I wash mine down with soap and warm water and it’s pretty easy. I also have a stainless steel grate which does the job but slightly more difficult to clean using a wire brush and some “elbow grease”. You usually find that stainless steel grates are confined to the cheaper end of the market. The third option is cast iron which is really heavy duty and I would argue is probably the most difficult to clean but if you want perfect grill lines on your steak then this has to be the best option for you. Flame Control A subject close to my heart with the charcoal grill where patience is the order of the day. In the case of gas, many gas grill manufacturers put a lot of time and effort into designing, patenting and marketing their respective solutions. To be honest I've always found all the individual technologies to as good as each other and find it difficult to split them. That said, Charbroil has released the IR (infra red) range recently (the photo at the top of the page) and I hope to get my hands on one soon and see how it performs. Start your outdoor barbecue grill comparisons by clicking on the links below and check out the different brands and technical specifications. If you want to drill straight down to a specific model the check the links on the right. That was barbecue grill comparisons, I have built a separate section for barbecue smokers but inevitably there is some crossover because many models will work as a smoker as well as a grill. Please note that this outdoor barbecue grill comparisons guide is designed to help you focus on the features and benefits of each grill so that you can make an informed choice. For practical reasons I have not had the pleasure to road test every single model listed.